Catholicism is a culture of sacred presence. Relics of saints (pieces of their bodies or objects touched to their bodies); water, soil, or other matter associated with sites of miraculous events; statues, images and crucifixes are all media of presence. (This is not an exhaustive list!) Holy cards belonged to this culture of presence too. This was most obvious in the case of cards that came with a miniscule relic affixed to them and visible in a small transparent window cut into the paper. 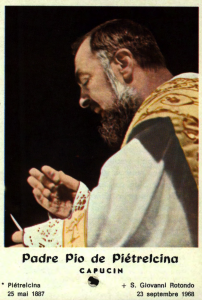 One of the most popular holy cards of the twentieth century showed the southern Italian stigmatic Padre (now Santo) Pio, saying mass, his bloody hands folded in prayer, and included a tiny piece of stained fabric that had been touched to his wounds. But all holy cards were media of presence. The devout kissed them; they held them while they prayed; the cards were exchanged from hand to hand; they were tucked into the frames of bedroom mirrors and taped to walls. They were used in the making of household shrines. Holy cards were carried into all the spaces of the modern world, onto battlefields in soldiers’ pockets, for example, into industrial and post-industrial workplaces, and especially into hospitals. Holy cards were most often given as gifts. Teachers gave them to their students to reward and encourage academic achievement; priests distributed them as spiritual tokens; parishes sent scores of them in bundles to service men and women overseas. The cards were used to commemorate special events, when children made their First Communion, for example, or on the occasion of a priest’s anniversary as pastor. They were given in gestures of consolation and sympathy to the sick or dying. They were also exchanged in friendship and affection. In this way specific cards, saved over the years, bore the memories of particular persons and times, and the circulation of holy cards disclosed as it contributed to the constitution of particular Catholic social worlds. Catholics customized holy cards for their own purposes. They glued dried flowers to them; wrote messages in the margins; sewed medals to them (some cards came with medals already attached); colored them. Children made collages of holy cards to celebrate a saint’s feast or as a gift to their pastor or parents. Holy cards existed within the tradition, but like other features of a living tradition, persons who also existed within that tradition appropriated them for themselves in their own ways. The question of gender insists on itself here. Women gave holy cards to children; women exchanged holy cards; women distributed cards to the sick. Were practices related to holy cards solely the province of women? This is often assumed about Catholic devotionalism generally, but such claims need to be viewed in a wider frame. All forms of religion that did not exist within the permissible boundaries assigned them by liberal modernity were identified as infantile (on the level of persons), “primitive” (on the level of cultures), and associated with women, children, dark-skinned others, the poor and working class. In other words, certain religious practices have been gendered feminine, but this does not mean that men did not participate in them; if anything, such normative assertions obscure the many different forms of men’s religious practice. So it is in the case of holy cards. 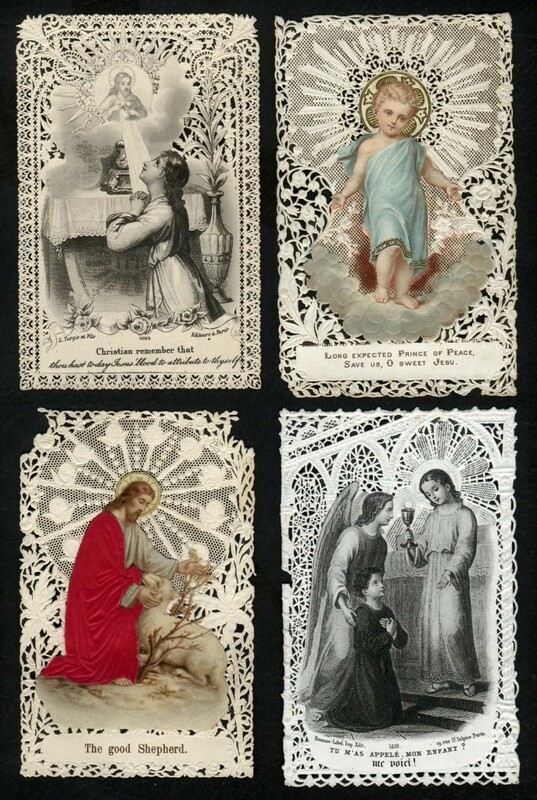 To take only the one example already noted, holy cards were ubiquitous among servicemen in theaters of war, much sought after as aids to prayer and piety as well as talismans and reminders of home. Particular devotions, moreover, such as that to the Sacred Heart of Jesus—and so also holy cards of this image—were associated with men. I have never met a Catholic man who did not have a holy card somewhere, in his wallet, perhaps, in the glove compartment of his car, or the top drawer of his bureau. The gender politics and dynamics of devotionalism are real, but the question needs to be approached with critical attention to normative constructions that obscure lived religion. 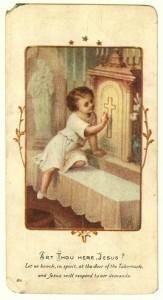 As the references to children suggest, holy cards were integral to the modern culture of Catholic childhood. Holy cards, which just massively surged through Catholic childhoods, had many different functions in the relationships between children, on the one hand, and priests, nuns, and lay brothers, on the other. Most generally the holy cards served as tokens of recognition—of achievement, of piety, of athletic success, but above all of a child’s existence amid the mass of other children in crowded Catholic homes, parishes, and schools. Modern Catholicism was not a culture that valued or rewarded individuality. Catholic children were commonly warned in school and church not to do things that would set them above or ahead of others. The gift of holy cards existed in counterpoint to this and was all the sweeter for it. The infant Jesus in various guises (as the Infant of Prague, for example, or the Santo Niño de Atocha) was a popular figure on holy cards, especially those given to children. 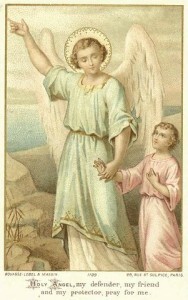 Then during the darkly romantic late nineteenth and early twentieth century Catholic vogue for child-saints, in particular those who had died a heroic death, the images of saintly children and adolescents also began appearing on holy cards. (One of the great descriptions of this phenomenon is Jack Kerouac’s memoir of his brother Gerard.) Before and during the Second World War, German nun Sister Mary Innocentia Hummel produced hundreds of different devotional images of children that became widely popular on holy cards in the postwar years, a striking alternative to representations of German national identity during the war and in memory afterwards. Death was an especially important occasion for the use of cards. Families distributed black-edged holy cards to mark the passing of one of their members, miniature versions of the death announcements posted on the walls of villages and towns in southern Europe. 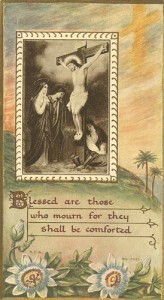 These cards, like the posters, often included a small picture of the dead person, along with the exact date of death and a prayer for the soul. I knew someone long ago in the Italian Bronx who made the rounds of funeral homes specifically to collect these cards; over the years he gathered into a shoebox a visual necrology of the neighborhood, with the dead resting in the company of the saints. He also documented in this way the passing of the neighborhood itself. 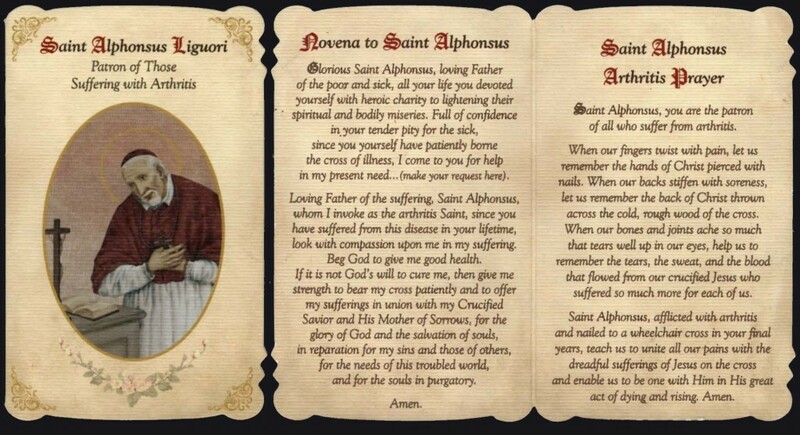 Many holy cards came printed with prayers that carried special indulgences, meaning years off time spent after death in Purgatory, when recited a specified number of times. The indulgenced prayer could be said in anticipation of one’s own death or as an afterlife gift for a dead family member or friend. These cards existed in this way on the border of life and death, as documents of passage from one life to the other. Holy cards took on different appearances over time reflecting broader changes in technology, taste, and theology. Four-sided cards with the images printed in the form of a diptych could be folded over to make a little shrine. Some cards were adorned with lace edges or were printed on textured fabrics that heightened their tactility. Cards with magnetic backs appeared on refrigerators. Late twentieth century holy cards for children depict the saints as action heroes. The process of lenticular printing created 3-D images that shifted when the card was moved—the saint’s eyes opened/closed; the saint before/after martyrdom—giving the cards the quality of an apparition. Images often yielded to words after the Second Vatican Council, the cards mimicking the transformation taking place within churches, where the saints were removed from their niches and replaced by felt banners bearing the messages “Pax!” or “Joy!” Holy cards now bore messages of social justice and prayers for peace. But the fact of change ought not to be exaggerated. New Catholic migrants and immigrants brought holy cards with them of their local saints, for comfort, company, and support. Holy cards were included in letters back and forth, along with pictures, cautions, and money, a kind of sacred remittance that could arrive from either direction. American Catholics continued to give and receive holy cards and to save older cards printed long before the Council that they had inherited from parents and grandparents. Holy cards do not flow along a unidirectional trajectory of time. Instead, their circulation discloses visually the multiplicity of temporalities within which moderns make their lives. In this way they are handy little markers of the religious circumstances of our age.